Of all the amazing things. 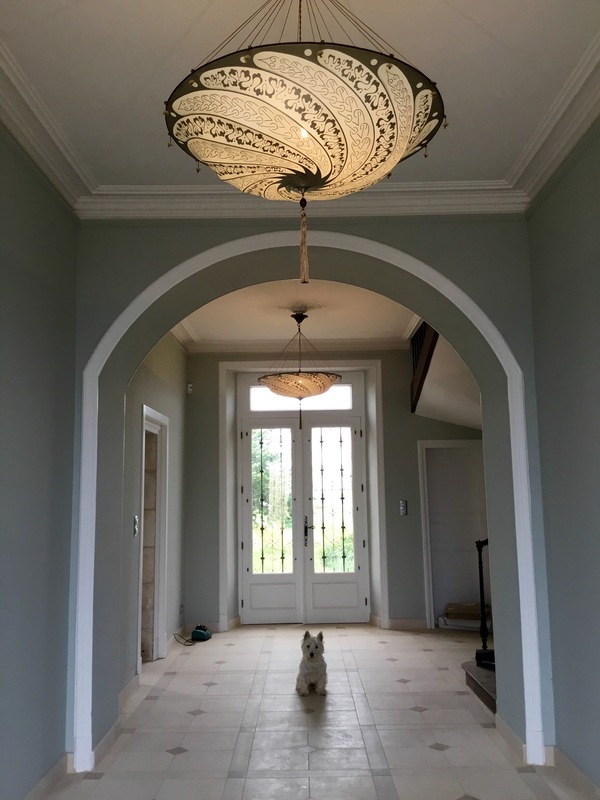 I walked into the house yesterday afternoon and the electricians had hung the pendants in the entry hall. I ordered them about 18 months ago, back when the guys said they would finish on time. They have languished in a box ever since. I have lived in fear that they would get mildewed or crushed or suffer some other horrible fate. But no, they survived and here they are. Unfortunately, so are those horrible metal caps. This will do if I don’t ever look up but I’d rather find another electrician, one more sympathetic to old houses. Meantime, Jacques and I will be grateful for what we have. Looks beautiful, and very grand, as I knew it would ; and that is one decorative dog you have there. I have to say that I cannot understand why the fittings can’t be made flush with the ceiling, there is space above it surely? Or, could a decorative circular plaster moulding be fitted to conceal the cap thing? If it’s going to be a house wide problem, I’m sure someone adept at making plaster details with moulds could knock up a sectional one ( Maybe a quarter circle) , then just fit them, fill the joins, and paint. Voila!. Not only is there space — they ran new wiring, after all — but the rosette has a little center section that is already detached. So why can’t they put the connection up above? Beats me. Pass, is this some weird French logic or entrenched practice? I think it’s electrician logic. What gets the fixture up in the keast time? Ugly is the client’s problem. That is not how it should be. You are paying them to do what YOU want. In a place like yours, cool, clean, stylish, dramatic, design- led… It should be spot on. I pick my battles. It works, it’s safe, I want them the hell out of my house. JY fights hard for the essentials. He’s trained in electrical engineering, plus he spends a fair amount of time handling litigation, so he’s pretty effective. I can’t ask him to go to the mat over aesthetics, too. Enough, already. I asked, the answer was “not possible,” for now that’s the end of the story. Yes, the silk ones. I could almost afford to buy them once. Twice would have been out of the question. Thank you. Now to move in a couple of pieces of furniture. Thank you. I am amazed. This is the entry I imagined, seems like ages ago. It’s nice to see it happen. Next Post I can now sleep in my own house.